In this chapter we’ll be showed a custom QML application to provide examples of the common operations performed on a database: Create, Research, Update, Delete (ie: a C.R.U.D. application). That sample application will have a basic user interface (our focus is on the database access part) and don’t have an important real use; was chosen and created only for his didactic relevancy. Note: This chapter don’t cover the steps necessary to package, test and deploy the application (will be the focus of next chapters). The application that we are going to describe is a "weather temperature recorder". 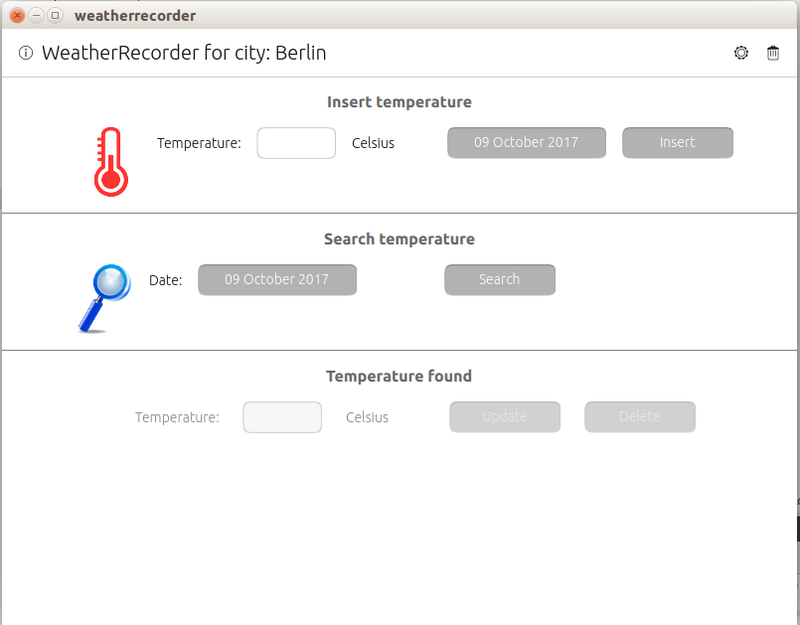 Using it, the user can insert the daily temperature value of his favourite city and manage the saved ones: update, delete or search them. At first start-up, the application must provide default configuration values for the target city and the temperature unit (ie: Celsius or Fahrenheit degree). The user can accept the proposed values or insert custom ones (the saved configuration can be updated later if the user want do it). Each day the user can insert only one temperature value. Saved values can be searched by date. If a value is found, is possible modify or delete it. Is also possible execute a batch deletion of all the saved temperature values. The application must provide a validation system to prevent invalid insert, like empty or not numeric values. Set-up the Ubuntu IDE and SDK as described at the beginning of this course creating at least a "Desktop" kit. During the import, Ubuntu SDK ask to choose the "Target kits" for the project (ie: the platform where the application will be executed). We want run our project form the IDE, so that is necessary flag an existing "Desktop Kit" or create a new one. You can find more details about "Kit" at the beginning of this course. Feel free to open and explore any files and study the project structure before continue. Before concentrate our attention on the database access, we want provide some background informations that could be useful for the future. The entry point of a QML application is the Main.qml file, it contains the code that create and start the full application. Running for the first time our application (press the green "Play" icon of Ubuntu SDK) is shown a configuration dialogue filled with default values. If you like them, press "Save" button, otherwise modify them before save. All the code placed inside that block will be executed when the event onCompleted is raised. In this case each time the application starts, because the above code is placed inside the QML Page component. But, the onComplete event is raised for any other component, so that can be used to initialize it instead of the application. When the onComplete event of the Label component is raised (ie: when is drawn), is executed the code that initialize the Label (e.g. loading the text to display from a database or other source). In general, the onComplete event is used to perform some initialization tasks at application or single component level. Database and tables creation (we’ll talk about that in the next section). Inserted default values (ie: the ones shown in the configuration dialogue shown at first start-up). Now, someone could say: "...we don’t want perform that operations at each application start !" Right, to prevent this, the solution adopted is the use of Settings component. It provides persistent application settings (ie. user preferences or other customizations to be persisted on a configuration file). It declare a boolean property named isFirstUse initialized to true. After the first initialization operations, inside the onComplete management block, is set to false. With this solution, next time the configuration dialogue will be not shown and the database initialization will be skipped. 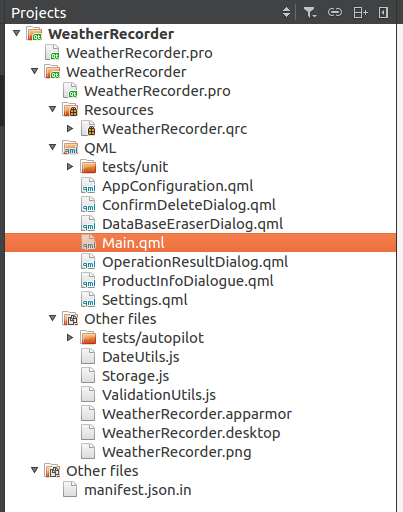 In our case is weatherrecorder (is the value assigned at the parameter "applicationName" in Main.qml). Feel free to open that file, is a simple text. Removing it, or setting to true our flag value, at the next application start will be executed the initialization operations (try it if you want). Also, note that in the project sources there is a file named Settings.qml. It must contains all the flags/variable to be stored in the weatherrecorder.conf file. The Settings component can be used to implements any other logic, not only for the use case described here. The user interface and his use is quite simple, so that we omit his description. Before continue we suggest to try it to get more confidence with the application behaviour. Just some notes about the header bar of the application that could be useful for future applications. We can see two "action" bars: one in the upper right corner and another in the upper left one. The left one is named leadingActionBar, the one on the right is named trailingActionBar. Look in the Main.qml source code and his code comments to know how are implemented (perform a search in that file with a CTRL+F). As said before, we don’t use U1Db-QT API but QtQuick.LocalStorage object to perform the database access. The database type used by Ubuntu Touch (Ubports) is SQLite a file based database that support SQL as query language. To use it from a QML application are not necessary installations or configurations: everything is provided by QML and Ubuntu SDK. Our database access logic is contained in the file named Storage.js (there is no naming convention for that file, you can use another one or use DAO pattern if you prefer). The following examples are taken from that file. Follow the description of the database operations performed by our application (see Storage.js file for the full code). Note: as first thing, is called the getDatabase() function the return a database connection. Like the above code, each time we need to perform a database query (ie any C.R.U.D. operation) is necessary open a transaction that is passed at the callback function containing the SQL statements to run. If the callback function throws exceptions (ie: an error), the transaction is rolled back (a ‘transaction’ is a set of operations that must be executed with success, if one of them fails is executed an undo to restore the status before the execution). For our example application, in the createTables() function are created two tables: one to store temperature values and one for the configuration parameters. No foreign keys are used. (The above code is the one placed inside the < SQL Create statement > placeholder). Obviously, the declared data-type of the table columns are the ones supported by SQLite database (the type "date" is not supported, so that is declared as TEXT). Note the use of a field named "id" and marked as Primary key (PK) in the two tables. That field is flagged as AUTOINCREMENT so that each time a new record is inserted in the table his value is automatically incremented by SQLite. The use of an "autoincrement" field as PK is not mandatory if there are field(s) that can identify only one record in the table (we choose to use it to provide a further useful feature of SQLite). After the execution of createTables() function the SQLite database file is created and two tables are inserted. On Ubuntu Touch (UBports) systems is /home/phablet/ on Desktop systems replace ‘phablet’ with the name of the logged in user (type the command whoami in a shell to know his name if you are not sure). That folder contains two files: a .sqlite and a .ini one. The database file is the one with .sqlite extension (the name is an unique id created by QTQuick.LocalStorage). The .ini file is a file descriptor associated at the .sqlite one. Don’t worry about their strange names, is not necessary remember or manage them. To see our two tables and perform SQL query, open the .sqlite file with a graphic interface like Sqliteman available in the "Ubuntu software Center". The result is the content of the configuration table (ie: our configuration parameters provided at the first application start-up). If you right click on table name is possible perform some administration tasks on the table (add or edit column, delete the table and so on). Obviously any modification made with Sqliteman affect the application that uses the database (e.g. : if a table is dropped our application will crash because is necessary modify the application). With a research operation we look inside the database table(s) for a specific record(s) matching some search criteria. That operation is done with a SQL select query that return a set of zero or N table rows matching the criteria (for us record and table row are synonym). The returned set is usually identified with the result-set name. An example of research, can be found in the function named getTemperatureValueByDate in Storage.js file. That function is invoked when the user perform a search operation in the user interface passing as input the date for which want to know the temperature value. get access only at the first record of the returned result-set (note: the count is zero-based) and from it take the value of table column temperature_value. We can do that because we have executed a select query; using other SQL statements (see following sections) the returned information will not be a set of table records but a simple number. where console is a built-in object used to print messages on the console (is similar at System.out.println("a message") in Java). The logic and the returned value are similar at the update operation, except for the SQL statement executed. We invite to modify the source code to clarify some possible doubts (this is the best solution to understand and improve your knowledge). Also, take a look at the comments placed inside the source code. In the next chapter we’ll talk about charts. We will see how to create a chart displaying our saved temperature values using QChats.js library. For SQL language: https://www.w3schools.com/sql/sql_intro.asp only the syntax for the base statements: insert, update, delete, select, create. For QML API: https://docs.ubuntu.com/phone/en/apps/qml/index the official reference for Ubuntu Touch documentation. Miguel Menéndez: revision of the chapter in English. Translation into Spanish.